Search Builder is the go-to tool when you want to build a target group to email, print labels or run reports for, or just to find out how many people match your criteria. You will use Search Builder to mine your TouchPoint database using conditions you specify. Each database created after May 16, 2017, will contain 5 sample searches. You can use those to get started building your own. If you do not see all of these searches when you go to Saved Searches, enter the word sample in the name field and press search. These are just a few ways to use Search Builder to find people based on the conditions they meet at the time you run the search. Members, aged 30-40, who have children of a specified age range that have attended something in a specified number of days. Everyone who attended a Worship Service as a New Guest during a specified date range and has not attended a Life Group. The possibilities are endless…or at least close to it! Once you run your search, the results will be a page giving basic information about the individuals. The results page will always contain the same columns. Use the Blue Toolbar for any actions or reports you want for this group of individuals. 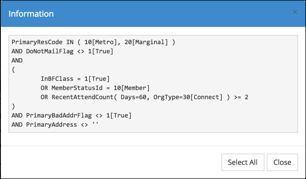 Search Builder is also used to create Status Flags . There are a couple of places you will see View Code or just Code in Search Builder. One is when you are viewing Saved Searches. It is beside the Description/Name of the saved search. The other place is on the search itself just below the list of Conditions. Whether you click the link on the Saved Searches page or when viewing an individual search, that link will do the same thing. It will show you the code that is used to run the search. Notice in the code where you see OR. This is where you have selected Match Any above those Conditions. When you see AND, this is where you have selected Match All. To give you a view of your entire search without having to open up each individual Condition to do so. Even though it is code, it is a user-friendly way to examine your search. To allow an Admin to copy this code to use in a Python script. Then the script does not have to reference a search, but can contain the code for the search inside the script. And the user will not have to type in the actual code; he will copy and paste it. This will open the dialog with all the Conditions. If you know a key word for the condition you want, type it where you see Filter . This will filter for conditions with that word. Click on the one your want to add to your search. Or, click the Categories tab and select one of the 16 Categories. Then select the Condition you want to add to the search. Once you add the Condition to your search, you will need to select a comparison and a code. Or you will need to enter some text. It depends on the Condition itself. 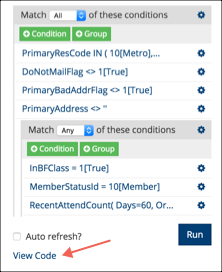 For example: the Condition Church Member Status has an option for Comparison of Equal, for which you select a Code from the dropdown list. Or you select a Comparison of One Of and then select more than one Code from the list. Click Save , and then Run to view the results with just that one Condition. If the box Auto Refresh is checked, your search will run automatically after each addition or change. Continue in this fashion, adding whatever Conditions you need for your search. If you add multiple Conditions, make sure have the correct option for the top Condition- either Match All, Any, None, or Not All. Save your search by selecting Actions > Save As . Enter the name of your search, making it fairly short, but descriptive of its purpose. If you want other users to be able to access your search check the box Make Public . Click Save. Each search contains at least one Group and you can add more as needed. We have a thorough explanation for using groups in another help article. There are a number of places in TouchPoint where you can select Convert to Search . This builds searches on-the-fly behind the scenes. For example, on a Meeting page under the Blue Toolbar > Gear , you can convert to search Attendees, Absentees or Guests by selecting the appropriate Convert to Search option. There are a number of other places where we have this feature, too. After clicking Convert to Search, your search will run and you can use the Blue Toolbar just like you would for a search that you created for yourself. Take a look at some of the places you will find Convert to Search links. There are 16 categories, each with multiple Condition options. The best way to learn is to just explore and click on each category to see the options. As demonstrated in the videos above, you will land on the All tab, where you have the option of entering a keyword to find a Condition; or you can select the Categories tab, select a category, and then select a Condition. Each Condition in the dialog box will have a ?Help Article button to the right. Click that to view the individual help article about that Condition. Watch the video below for instructions on building a search to find church members based on the date they joined. You must have the user role of Finance in order to see any results using these Conditions. As you see, there are tons of options to use and combine to make effective searches. The list above just scratches the surface. You need to experiment with various combinations to see just how flexible and far-reaching this tool can be. Here are a few videos to serve as samples to help you get started. Be sure to check out our YouTube channel as well.